Polyram is already an expert in providing high quality Polyoxymethylene (POM) and an Impact Modified POM compound that guarantees high impact resistance despite the natural brittleness of the original Acetal polymer. As we strive to accommodate the needs of our clients, Polyram has recognized that there are cases in which having a concentrate to modify prime Acetal Polymer is the best way to make it impact tolerant. A full compound is great when you require high impact resistance. If only a slight impact modification is needed, it sometimes makes sense to consider a concentrate. Acetal polymer is a great material for a range of products. It has excellent rigidity and abrasion, creep and solvent resistance, low coefficient of friction, good surface and nice appearance . Polyram manufactures a variety of POM compounds with high to low viscosity. Modified impact compounds with increased tensile strength improve quality and productivity for our clients, as they have less breakages and reduced defects. The modified impact compounds are however produced per prior and specific requirements. If a manufacturer needs more than one formula, or is looking for cost efficiency and flexibility in the production line, it sometimes makes sense to look at conducting impact modifications in-house. Polyram is unique in providing our clients with such a solution, when it is indeed the most suitable to their requirements. The concentrate is most suitable when a slight modification of the resistance to impact is required. Most especially when Snap Assembly of various parts to create a product is used. In this assembly technique, different parts are pressed together and “snapped” into each other. This is usually a manual process and therefore the parts have to withstand a range of pressure levels during assembly. A production person (no matter how professional) always applies slightly different pressures. The Acetal polymer needs to withstand this extra compression during assembly, but it also cannot become too stiff for the true purpose of the final product. This means only a slight change to material properties is required. Sometimes, the best way to achieve this delicate change balance is by diluting a prime Acetal and using an impact modifying concentrate during extrusion of the specific part. Acetal is easy to use in manufacturing. Its quality does not suffer from humidity in the production line, and it has a convenient window of extrusion. It can however be more sensitive to assembly conditions. Some assembly requires more flexibility in comparison with the natural stiffness of the prime material. 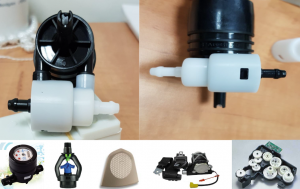 With the POM modifying concentrate, Acetal will prove suitable for parts that are good for assembly, thus replacing high strength polymers that are either more costly or less extrusion friendly. The higher impact resistance will also allow for the final product to have more durability during daily use, as less breakages will occur. Polyram can provide a wide range of grain-size for the concentrates. Factories can continue to work with the same MFI or carrier they are used to, without having to make changes to their production lines or manufacturing processes. Polyram has developed various formulas with different carriers. Using the concentrate is especially advantageous when a slight extra impact resistance is required for the benefit of the assembly line. In this case impact resistance can be optimized for assembly while the other properties that are more important for using the final product will remain unchanged. PMD849 – highly concentrated IM POM with medium viscosity. PMD843 – highly concentrated IM POM with high viscosity. Polyram’s impact modifying concentrate functions with both homopolymer and a copolymer. In the past, homopolymer (which is very costly due to its being manufactured by only two companies as well as availability constraints) was required in order to achieve certain properties, but now a copolymer could do the job when combined with our impact modified POM concentrate. Considerable cost savings are possible. A concentrate cannot always replace the full modified POM compound. We invite you to learn more about our IM POM products range. It all comes down to higher operational efficiency and product quality. When price competitiveness is a top priority, and very precise dosing capabilities are possible in the production line, a concentrate can be a good solution. Polyram recommends that you consider the diverse requirements, during extrusion, assembly and durability of the final product when you decide on the most suitable solution.